Fire and Emergency station office Barry Madgwick, manager trades and compliance John Wylie, head of halls Amy Lavini, Massey’s national facilities director Murray Foreman, and area commander Mitchell Brown. 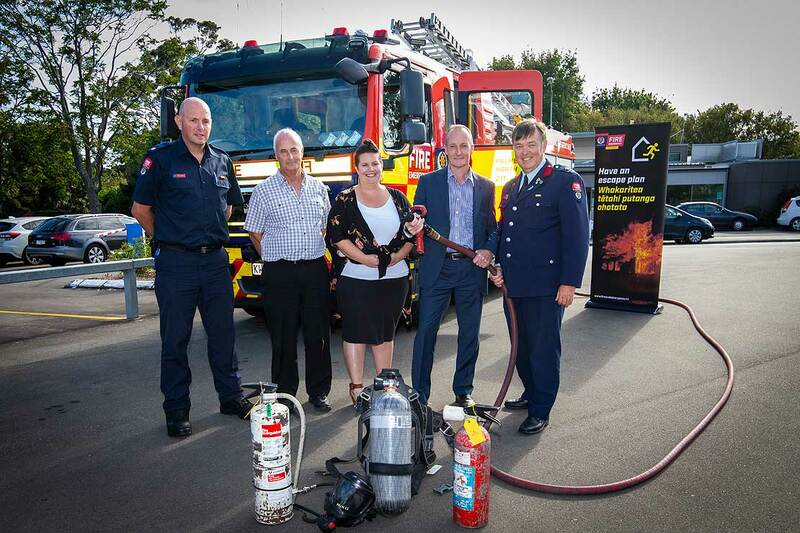 Fire and Emergency New Zealand and Massey University are teaming up to improve fire safety at the university’s Manawatū campus. A group from Massey and Fire and Emergency meet on Wednesday to formally sign the agreement, which is seen as a pilot for other tertiary institutions. One of the partnerships goals is to work closer with Massey’s accommodation services to better educate students in the halls about fire risk management, with the flow-on effect of preparing them for leaving the halls for flatting. Another goal is to reduce unnecessary fire alarm callouts. Massey trades and compliance manager John Wylie says there are clear benefits for both sides of the partnership. The partnership has already seen Fire and Emergency teams involved in orientation week.